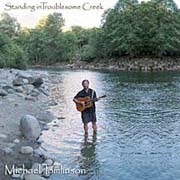 I love Standing in Troublesome Creek! I keep thinking you can't keep writing songs that mean so much to me but then you do it again and again. Wow! Who says you need a band? I love hearing you sing with your guitar - your new songs are fantastic. Thank you for what you're doing, Michael.